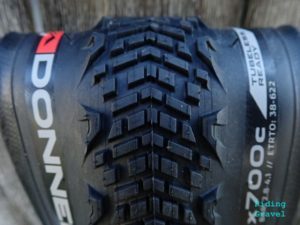 The Donnelly EMP is the newest gravel specific tire from the company that was one of the earliest proponents of gravel specific tires. This model was recently introduced and we wrote up our first impressions here. Now that some time has passed, and they have been ridden, here is some impressions concerning how they ride and feel. Let’s dig in…. The Donnelly EMP tires are the company’s newest treads for gravel riders. Mounting And Tubeless Performance: The EMP tires were mounted to the HED Ardennes+ wheels that have been used over the years here on Riding Gravel for several tire tests. If you are not familiar with the Ardennes wheels from HED, they use basically the same rims as the Belgian+ rims. The EMP tires went on without a hitch and aired up without a fuss. Pretty average in this regard. 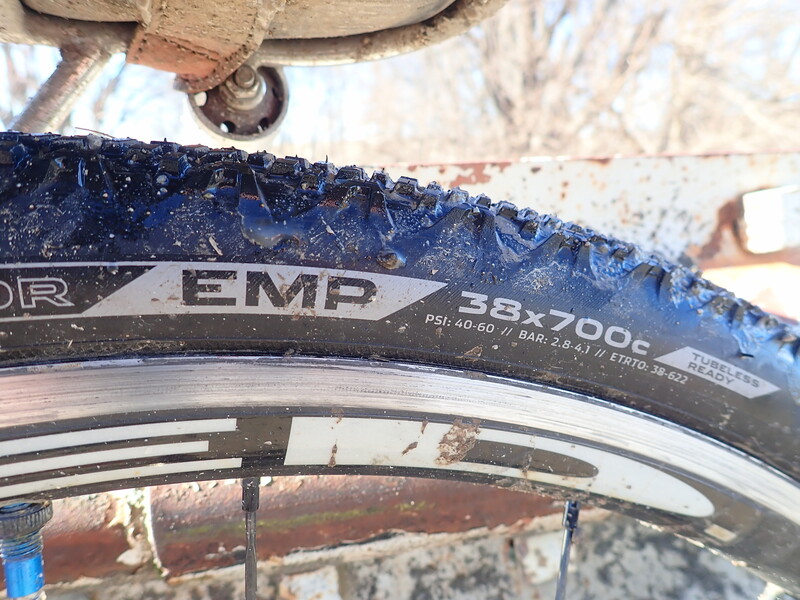 As far as tubeless performance, I would say the EMP holds air over time reasonably well for a tubeless tire. I have had no unusual experiences to report there. So far, the EMP has been very good in this respect. The EMP tires seem to roll quite well. 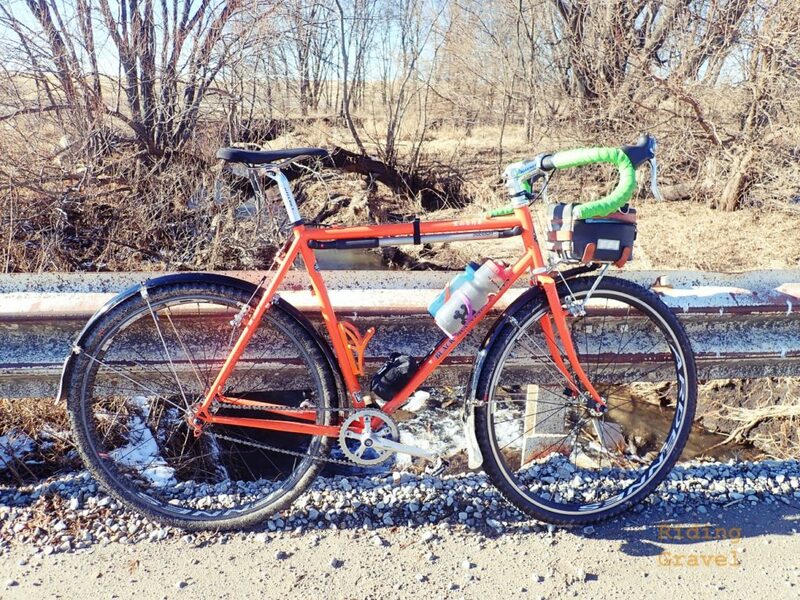 Ride Performance: With Winter being somewhat kind in the Mid-West through December and Early January, there were opportunities to get out and ride the EMP without dealing with much snow, ice, or sub-zero wind chills. What I was able to find out is that this tire does a couple of notable things for a tire in its category. First of all it rides smoothly. Many times tires with puncture protection belts do not ride well. So, this was a nice discovery. The other thing I found was that this tire has a nice, free feeling roll to it. That is also somewhat unusual for tires with puncture protection belts. Those two things make the EMP a bit of a surprise in the category of tires aimed at dealing with the Kansan Flint Hill’s nasty sharp gravel. That aggressive tread doesn’t seem to be too stiff so the EMP rides smoothly. So Far……. The conditions have changed a lot since the start of the year here where I test, so this review is going to be put on hold for a bit. That said, The EMP shows a lot of promise for a tire meant to race in severe gravel conditions. 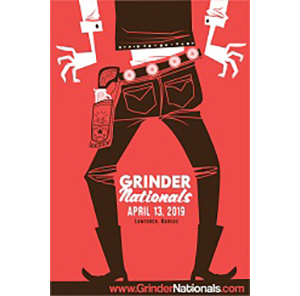 It rolls well, feels fairly comfortable, and deals with hard edged, broken pavement in a manner that should translate well to heavy, loose gravel conditions. The width and volume are not that of a 40+ millimeter tire, so don’t expect a plush, super-stable ride with the EMP, but for those willing to forgo such niceties, the EMP appears to be one of the better sub-40mm tires that has been released. As stated, Winter has moved in here and I don’t expect to get any meaningful test rides in for some time. Look for the “At The Finish” post to hit the site here, hopefully, in late February/early March.